Ever since she was a little childling, Eff has been told that she would bring ruination down on anyone close to her. That's not something that's easy to hear and it's worse because Eff knows that it could very well be true. Eff is a thirteenth child and everyone knows that thirteenth children only bring bad things. To complicate matters, Eff's twin brother Lan is a double-seventh - a seventh son of a seventh son - and everyone knows that he's going to be one of the most powerful magicians one might ever care to meet. Between the two of them, the Rothmer family can't get a moment's peace. When Eff's Papa decides to accept a professorship at a frontier college in the west close to the Great Barrier, it means uprooting most of the family. It means possibly facing dangerous magical creatures. And it also means that Eff and Lan might have a chance to grow up without the watchful eyes of the aunts and uncles that presume to know their destinies. 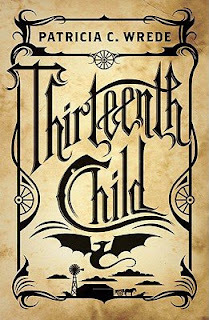 The Thirteenth Child is a sweeping story of Eff's childhood. It starts with her at age five, being tortured by her cousins and verbally abused by her Uncle Earn because of her birth order. When the family moves out west, Eff starts to study magic and she makes the decision not to use her magic for fear she would hurt someone that she loves. Eff tells us about her childhood on the frontier up through age 18. To be honest, I didn't like this book as much as I thought I would. What I did like was the world-building and the wonderful alternate history that Patricia C. Wrede has created for us. I love alternate histories and this one was fascinating. A frontier America with magic... The settlers in this wild west are facing things that are truly wild - swarming weasles, mammoths, steam dragons... A fantastic variety of creatures, both magical and non-magical, are ready to attack any settler who wanders west of the Great Barrier. I also liked that there was more than one type of magic in the world. Eff studies not only Avrupan ("European") magic, but Aphrikan and other types as well. This New World (called "Columbia") is a mixture of many different cultures. Ooh, I also like the Rationalists, which is a group of people who don't believe in using magic. Very interesting! So, yes... it's an intriguing world that's been created. Definitely a world in which I'd like to spend more time. My problem was that I never really felt a connection with Eff. The narration is such that it felt like Eff was looking back over her childhood as an adult. In 340 pages, we get Eff's entire childhood. Some of it was fascinating, but some of it was kind of boring. A lot happens, but at the same time it felt like there wasn't really a plot. I almost put it down several times, but in the end I'm glad I kept going. Still, it wasn't a book that I dove into and read straight through. It took me almost an entire week to read it. Will I check out the next book in the series? Probably. I do like the world quite a bit and I guess I can hope that now that we've built the world and gone through Eff's entire childhood, there might be more action in the next book. Plus, (I won't spoil anything by saying) Eff's potential career path opens up a lot of very interesting possibilities for the sequel. Check out other reviews at Book Aunt, Children's Book Reviews and Then Some, Book Dame, and Persephone Reads. The world-building sounds interesting. I'm reading a Patricia Wrede right now, my first of her works (The Sorcery & Cecelia series). I might add this one to my list. I was so happy to see the premise of this book and the promise of a new book by Wrede. But I too felt that Eff was distant from what was happening. I actually put the book down 3/4 of the way through because I realized that Eff was more of a witness than a protagonist. Me three about Eff. I kept trying and trying to find some way to connect to her and just never did. Tasha, I too put the book down at about the same point, but picked it up and finished because others were so enthusiastic. Unfortunately, I felt the same way when I finished. PS: Thanks for the link to my review @ books4yourkids.com!